Excellent value, very nicely lined. Fabric has a bit of a sheen. 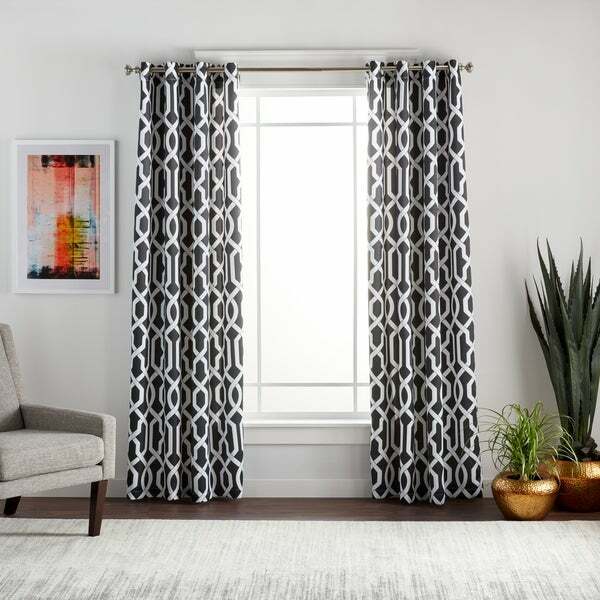 Keep your room cool during the summer with the Lush Decor Edward Moroccan Pattern Room Darkening Curtain Panel Pair. Choose from a selection of neutral colored panels that feature a contemporary Moroccan trellis pattern in a crisp white color. Hang the curtains with ease from the solid grommets. The polyester fabric is machine washable for added convenience and easy care. I absolutely love these panels. I ordered three different panels and this was the winner. I didn't want total blackout panels. I wanted some light to filter in. These are perfect. The fabric is thick and soft. I ordered the grey. If you're looking for total blackout look at Victoria Classics Amadora Grommet. They blackout all light. I started with one set and have since purchased two more sets for the adjoining rooms. I like the fabric because it is easy to maintain, machine washable. The curtain falls and puddles nicely in the floor. I prefer that my curtains hang long so I order them longer than needed. 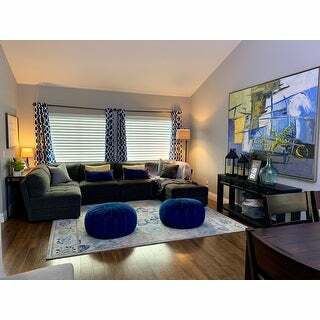 This fabric and pattern adds a clean contemporary look to the room at a reasonable price. The color I selected does not fight the room decor, it just provides a lovely background to build from. Light gray & white with a contemporary vibe, the fabric hangs beautifully. 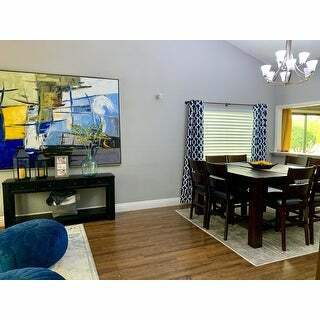 Bought two different size panels for two different rooms and both colors and patterns match. These are not black out curtains, but just what I was looking for letting some light in but cannot see inside from the outdoors. Worth every penny! This is where reading reviews was so helpful. 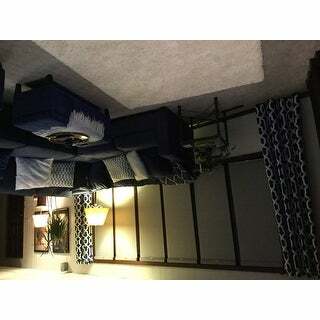 We were looking for something to tie our recently painted white paneling with our navy sectional. These drapes are a lovely satiny fabric. Since we intended to use them as decoration, not as blackout, these are ideal. They would offer privacy, but not blackout. 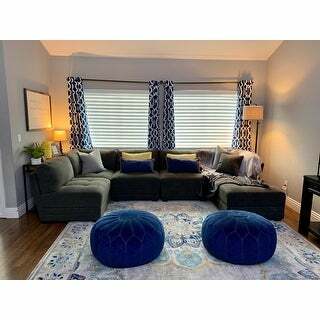 The Moroccan print perfectly blends with some pillows and blankets that are on the sectional. We love, love love them. Had to modify the drapes to fit our windows in our theater room so didn't realize until we put them up that they do not block out the light as what I call "Blackout" curtains. Obviously we cannot return them now. The white lining on the back is basically a thin white sheet and doesn't reduce the light in the room like other black out drapes do. Very disappointed. 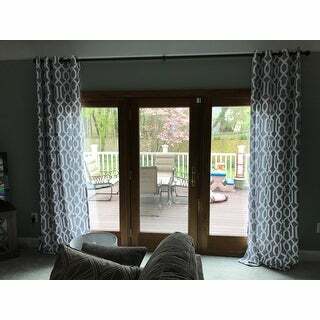 I gave this review a 4 because the overall quality of the curtain panels were excellent! They were beautiful and i wish i could have kept them. The reason why i was unsatisfied is that they are definitely not "Blackout" curtains. Blackout curtains should eliminate 90% of the light. These would be considered Room Darkening as they do not meet the criteria for blackout curtains. If this is what you are looking for, i fully recommend these as they allow a beautiful light to filter through an elegant pattern. I was looking for something different and therefore am completing a return. Love these drapes! Pattern and color is perfect. Material very soft and wrinkle free. My only reservation was that I needed 84 inches but when i received it and hung them They actually measured 82 inches and I needed to drop the rod. I suggest getting slightly longer. I purchased the grey curtains. First of all the title for these curtains says “blackout curtains” however these aren’t blackout curtains. The packaging with the curtains says “room darkening”. I will need to either buy something else for my bedroom or add a black out liner to these curtains. These are nice looking curtains as far as fabric, color, and the pattern. I would have preferred the grommets to be brushed nickel rather than antique bronze. Antique bronze seems odd to me with grey curtains and classes with my brushed nickel curtain rod. If you’re looking for black out curtains don’t buy these. Heavy curtain panels and liked the pattern, but didn't like grommets. Returned but if you are looking for large silver grommets, you will like these. Picture is deceiving on the blue- it is turquoise- not at all navy like it appears. Read the reviews, some reviews mentioned the material was shinny. I found them to be true to the picture. They are perfect for me, I am only giving it a 4 star because one of the panels have grease on it when it arrived. I have tried contacting customer service and getting no response. I tried washing it, it does not come out. Very disappointed with customer service. This piece was the absolute perfect addition to my house. It was all made, great price and the shipping was super fast. I highly reccomend this item. These were a great deal. I am happy with the look and quality for the price. Returned this item did not like the look. I like the pattern and color of these curtains, but the bottom hems are severely uneven on the set I received. I used a level to hang my curtain rod, so it's definitely not the rod. There's as much as an inch of difference between one side of the panel and the other. I should have returned them, but I didn't get around to it. I couldn't recommend based on the quality of the set of curtains I received, maybe they aren't all that bad though. Purchased these curtains for a "theater room" that we put in our home. The room as 2 windows and this was the perfect blackout item for watching movies during the day! The quality of the item is great! Would recommend this product! Beautiful! Exactly what I wanted for my living room and dining room! Good quality and beautiful design. Not totally blackout but worked well for what we needed. Fabric is a satin type with a little sheen. Would recommend. I have these in our bedroom in the blue. It is a pretty, dark blue grey color with a white pattern. They look nice and hang well. I've had them for 4 years now and they are starting to fade a bit. But for the price, I think that was a pretty good run. I am very impressed with the quality of these panels. As most have mentioned they are thick, with soft sheen. Filtered light so not totally light blocking but what I wanted. Actually , even though a lot of gray , they have brightened my low lit dining and livingroom. Love them! Very nice pair. As described. Would purchase additional panels if needed. "What is the return policy ? " "There appears to be a light gray and a dark gray on the choices. The only option to choose from on the drop down menu is "gray". If I order it, will it be the light gray or the dark gray?" I see grey in two sizes and taupe. "Description says includes 2 panels but in the product specs it say includes 1 piece?" "I need the blue in 108" do you know if and when it will restock? And can I be notified if and when it does?" "Is the width for one panel 52" or is that the total of two panels? My sliding doors are 120" so not sure what I need to purchase to cover it." I have a similar width so I bought 2 sets to have 4 panels on each side. I usually leave them open but once in a while I will close them and all 4 cover my slider. I purchased these curtains, and they are 54 long per each panel & is two panels in the pkg. I need to say these curtains are very nice and are packaged very nice but the problem I had was the length. I needed 54x95, when received the order I received 54x93. I called CS & advised of problem & so they sent return postage & a new set of curtains. Well the 2nd set was to long, 54x98! This went on back & forth 3 or 4 times which is ridiculous. Every pair I received was the wrong size. C.S rep.'s were very apologetic & tried to help each time I had to call them. So I would think a bit on ordering these unless your not concerned about the length. There are two panels, each is 52 wide. "Has anyone purchased the blue drapes ? People's monitors show differently, so I'm NOT asking what they look like to you on the screen. I need to know from an actual purchaser- if they are blue (like a slate blue or a muted blue) ? I definitely can not use turquoise or green color !" Definitely more of a slate blue. No green component to me. I have mine against a gray wall just like it is in the pic and it looks almost exactly the same. I love them. I have the blue and it looks a little more blue than the picture unless there is no sun it looks the same. "Is the blue color - a slate blue or a cornflower blue OR is it more of a turquoise teal green color? I need the blue, not turquoise or greenish"
It is not as dark as a true navy but closest - none of the shades of blue you named came close. Not bright in a Royal or cobalt blue either / although in our room it works with those shades of blue. Also it doesn't blackout that well.